Home & Away by Connie Flynn, a hand stitched textile banner inspired by the Suffragettes. Undaunted. The Fight for the Vote – Suffrage Stories from North Hertfordshire exhibition. Connie was inspired by researching the original Suffragette banners, recording the colours, materials and textile techniques used. She developed her own banner by using similar ideas to some of the Suffragette’s banner, hence Home & Away is formed by a collection of recycled clothes and cloth items which relates to and can be seen in a domestic environment. 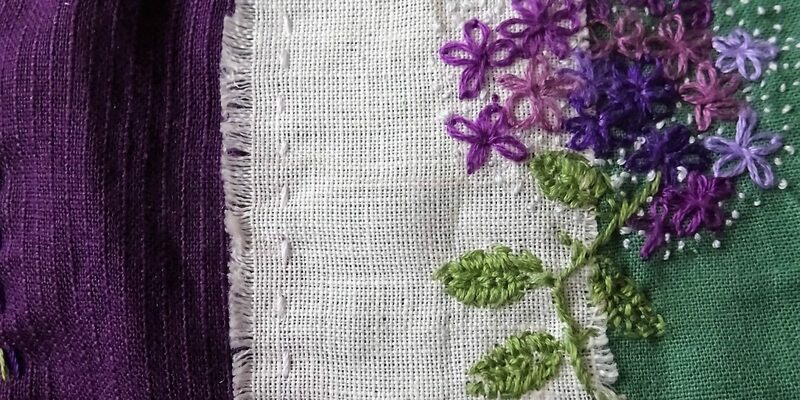 The colours carefully chosen to signify and represent the Suffragette’s palette – purple for freedom, white as purity and green being hope. Home & Away textile banner was made to mark and celebrate the 100 years of some women being able to vote, it signifies connections between time and events, places and people.